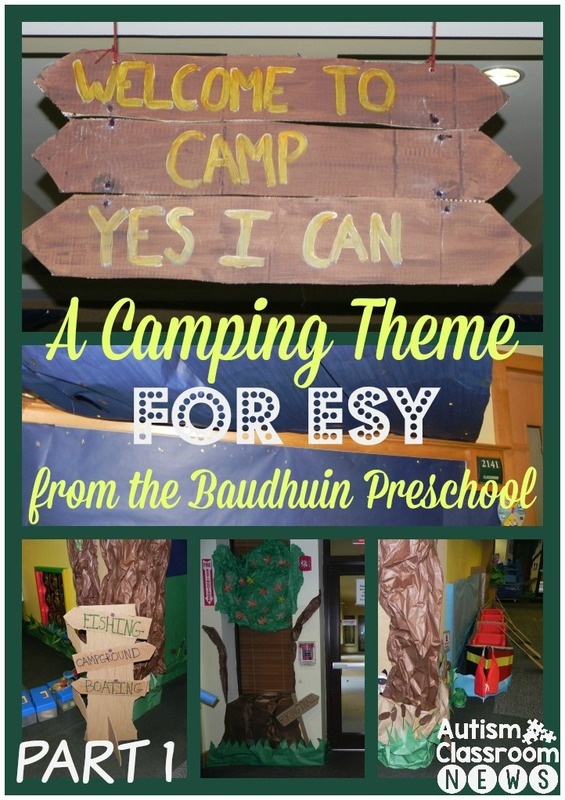 A Camping Theme for ESY from the Baudhuin Preschool: Camp Yes I Can. I don’t know about you, but I know that many of us are just DONE! At least for this year and with Memorial Day weekend coming up, I decided that we needed a brief break from serious topics, like prompting, and need some nice pictures that are easy to comprehend. I also have been holding this post since last summer and thought it was timely. I know many of you are working ESY so I wanted to share these stinkin’ cute pictures from the Baudhuin Preschool at Nova Southeastern University from last year. I want to thank Nicole and Sue for letting me share them on the blog. The Baudhuin school is where I used to work and it’s a preschool for children on the autism spectrum. There are a variety of autism programs at Nova from teaching professionals about autism and ABA to early childhood programs. You can read more about the school here and the autism programs at Nova here. The Baudhuin Preschool is set up in 3 cores of classrooms. 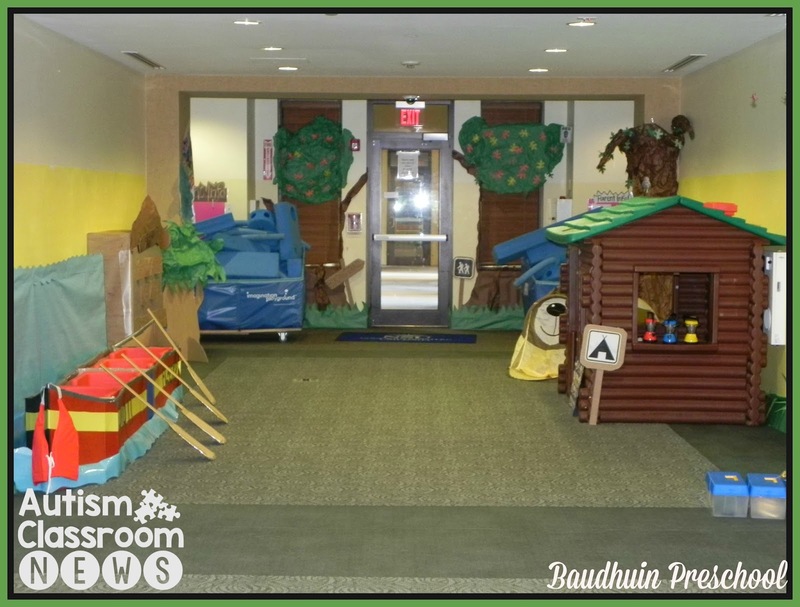 Within each core, the classes open up to a large open space that is used for indoor play and a variety of activities. 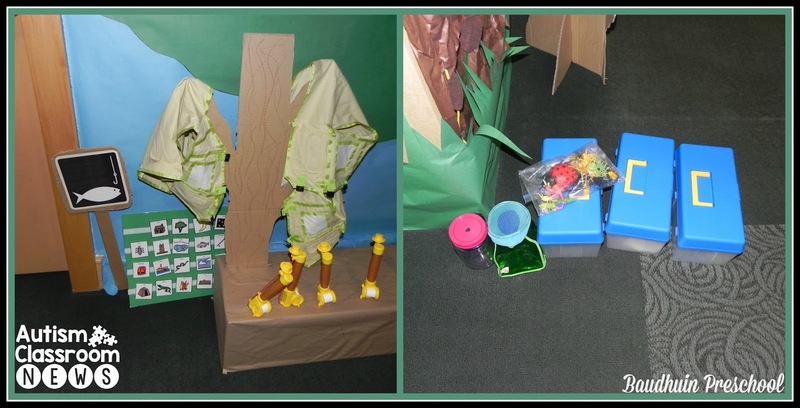 For ESY last year, they set up the core to be a camping theme to go with the Unique Learning System’s summer curriculum. The ULS curriculum is a camping theme again this year if you are interested in using these ideas to put the together (remember that the ULS summer unit is free). I want to share with you some of the ideas they put together to make the camp out of the core. I will probably complete 2 or 3 posts that will take us through Memorial Day and then will get back to ABA strategies. There are so many details that Nicole and her team thought of that I wanted to make sure I touched on them all. This is a picture of a part of the core and you can see the canoe, the log cabin, the bear and the trees. This is a sign made up as a treasure map for the outside of one of the classrooms as their “Where are we” chart. They moved the pirate around to the different places in the building where they might be found when they left the class. I thought this was so cool. 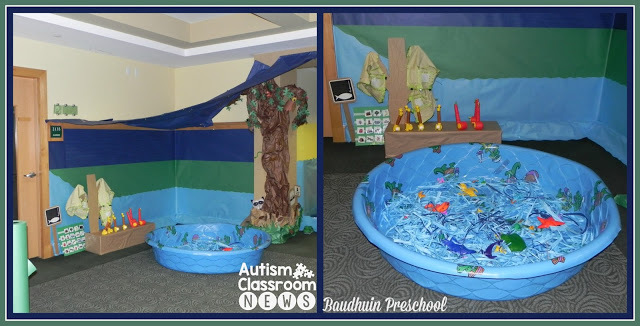 They made a swimming pool into a fishing hole using torn paper to fill it and look like water. They had a fishing sign, life jackets, tackle boxes and fishing poles all set up to be used. They could put things in the fishing pond and the kids could use the fishing poles to get them out. So many skills can be worked on this way to have them name items, talk about them, describe them, etc. I loved this as well. They covered the walls in paper and created the stream and the cattails as well as the blue rocks in the back corner. 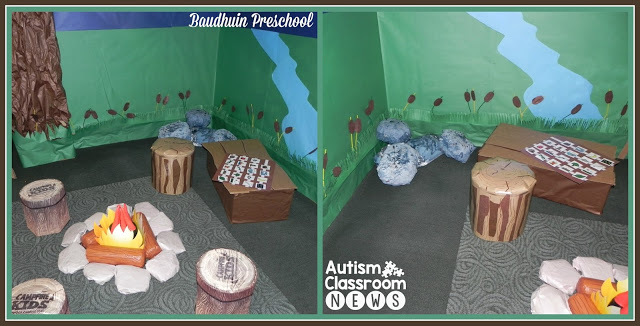 They made a fire out of construction paper and cardboard and had these cute stools that look like logs to sit around the campfire. If you look on the bench, you see a communication board. 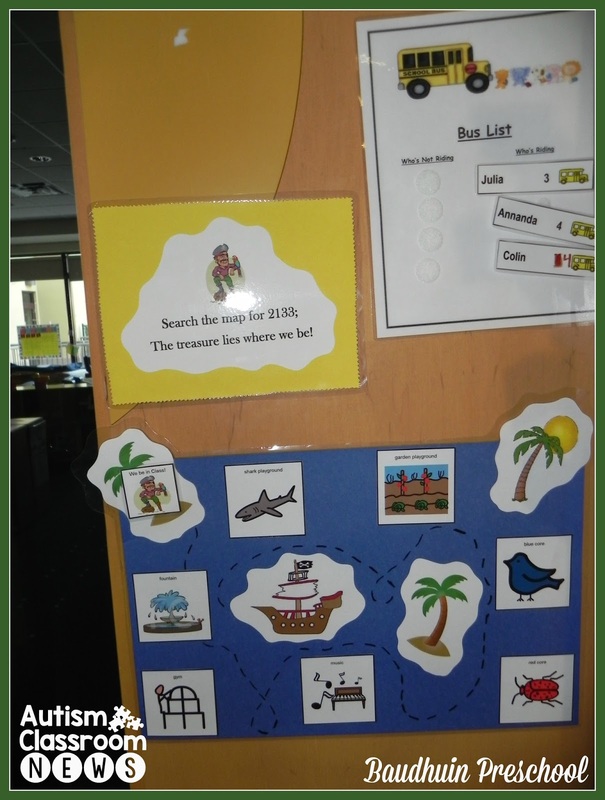 Each area had a communication board for the students to use to talk about the area with the vocabulary targeted for that specific activity at camp. I’ll focus more on the visual supports in the third post. 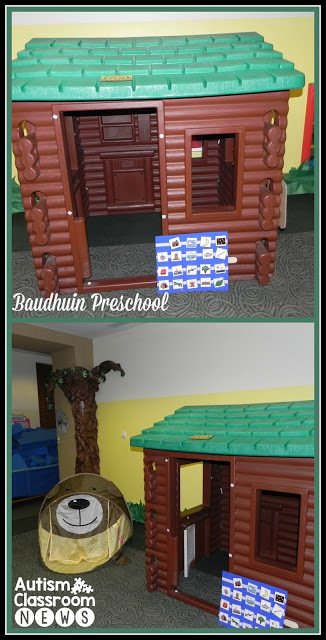 Finally, for today, you see the log cabin with the bear and the trees they created–I love the owl they put up in the tree! So, if you ware looking for some inspiration for a fun theme at ESY, consider camping. I’ll be back in a couple of days to share some more of these cool ideas. Until then, just keep swimming…the summer is coming!